Kalki avatar is the tenth avatar of Lord Mahavishnu who is believed to come at the end of this Kali Yuga to destroy the evils of Kali and inaugurate the Satya Yuga, the Age of enlightenment. The ten main avatars are Matsya avatar, Kurma avatar, Varah avatar, Narasimha avatar, Vamana avatar, Parasuram avatar, Sri Ram avatar, Sri Krishna avatar, Buddha avatar and Kalki avatar. Bhagavan Sri Satya Sai Baba is believed by countless devotees to be the Kalki avatar. Christians believe that Lord Jesus, who has already come and ascended to heaven, will reappear (perhaps in a new guise) at his Second Coming. Lord Jesus himself gave statements about this arrival. This can be understood from the Revelation sbook of the Bible. 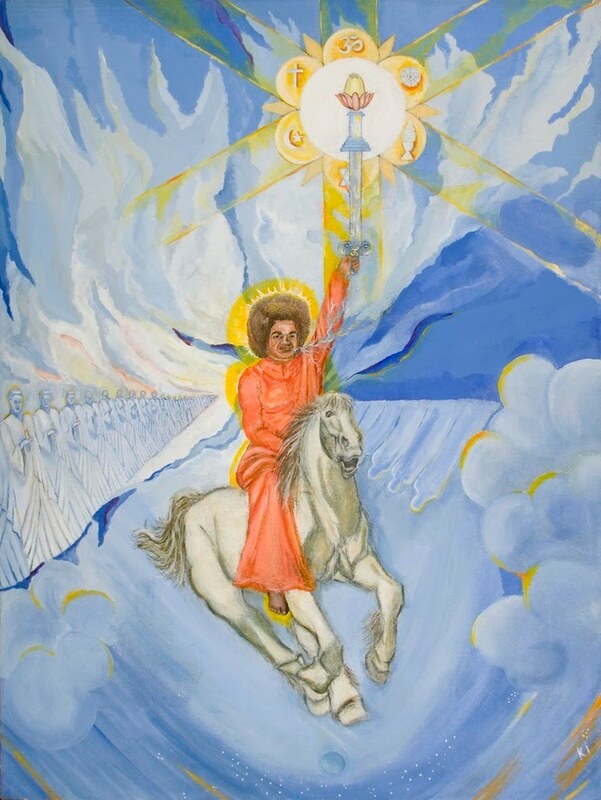 "And I saw Heaven opened, and beheld a white horse, and he that sat upon him was called Faithful and True, and in righteousness he doth judge and make war. His eyes were as a flame of fire and on his head were many crowns; and he had a name written, that no man knew, but he himself. And he was clothed with a vesture dipped in blood; and his name is called the Word of God. Horse clearly indicates the advent of the Kalki avatar who is described as riding a horse and who in this Kali Yuga has trifurcated Himself as the three Sai avatars (Shirdi Sai, Satya Sai and Prema Sai). Swami’s name is Sathya which, literally, means Truth. 'Judge' implies to teach and uphold, and 'make war' refers to fight against the evil thought filled in the minds of the people and to spread the truth "The establishment of Righteousness - that is My aim. The teaching of Righteousness, the spread of Righteousness - that is My object", declares Baba. The power of Baba’s eyes should be experienced than expressed .It can penetrate through the person till the core of his heart. His mere look can burn the evil tendencies in man .There is no doubt in describing it as flame of fire. The many crowns of Swami on his head are His extraordinary curly hair,each hair representing a crown and on the whole form a huge crown. This beautiful crown which seem to be the divine halo and is an ever permanent crown on his head. No one knew the name of His incarnation as Sai Baba until He Himself revealed it and convinced those who challenged Him to prove it. The young Sathya asked for a bunch of jasmine flowers to be placed in His hand and threw the same on the floor, to the utter surprise of everyone present, formed, in Telugu letters, the words SAI BABA. "The Word of God" is Truth. The name given to Baba at birth was Sathyanarayana, meaning the Lord of Truth. (Sathya- Truth)." Interestingly, the name of Baba's mother was Easwaramma, "the Mother of God." In the Vedas, the Word of God refers to the Primeval Sound, the Sound of Creation, which is AUM (Om). Whenever the name of God is recited, the word, ie. Aum is always prefixed to it. All the students, volunteers, sevadals and other workers around Swami in Prashanthi Nilayam are always "clothed in fine linen, white and clean." out of his mouth goeth a sharp sword, that with it he should smite the nations: and he shall rule them with a rod of iron: and he treadeth the winepress of the fierceness and wrath of Almighty God. Sharp words out of the mouth indicate the word of Truth by which He wins over the people from all corners of the world and all races and religions. Rule "with the rod of iron" is indicative of the strict discipline He expects of all those who declare to be His devotees. Thus as said in the Revelation identifies the possessor of those marks is "King of Kings and Lord of Lords" - a Poorna Avatar. Baba refers to Himself always as Sai Baba and everywhere He is known as Sai Baba only. The name Satya Sai Baba is being used only to avoid legal and administrative complications with the institutions and organizations that have grown around the previous Avatar of Shirdi. 'Saayin' in Sanskrit means 'warrior on horse back'. Kalki, the Avatar of our Yuga is described as an equestrian hero. The visions of Dasavatara forms (the ten incarnations of Lord Narayana) were once vouchsafed to a devotee. Sathya Sai Baba took him to the river and asked him to watch the reflection, His own reflection in the water. The man announced later that he saw at first Sathya Sai Baba Himself, then, only the halo of hair that surrounds His head, and then all the ten avatars in the order in which they are mentioned in the Puranas; the Kalki avatar on horse back had the form of Sathya Sai Baba Himself! 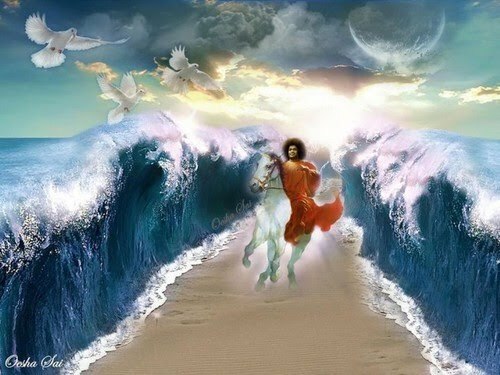 The devotee saw the last Kalki avatar seated on a horse as Sathya Sai Baba Himself. This again proves that Sathya Sai Baba is indeed the Kalki avatar of this very special Kali Yuga. Hilda Charlton was once granted the vision of Kalki Avatar. In 1969, she joined in the bhajan-session at Prashanthi Nilayam. the Lord was also listening from His lion-throne. hilda suddenly saw enveloping Him the form of an equestrian warrior-god, and went into raptures. when she made enquiries of this, she came to know for the first time about Kalki! Perhaps just like showing the visions of His past Avatars, He gave a vision of this future Avatar also. Sri Satya Sai Baba has been repeatedly declaring that the main mission of His incarnation is to destroy the evils of Kali and bring about the Satya Yuga or the ‘Age of Truth’ (which has just begun), which is the mission for which the Kalki avatar comes, indicating that He is (was) indeed the Kalki avatar of this Kali Yuga (which has just concluded). He has been working hard for the same and performing many leelas and drawing millions to the path of spirituality. On October 19th 2002, Sri Satya Sai Baba declared to a few close devotees of His that the Age of Truth, Satya Yuga had begun on that day. He performed a great leela three years prior to that day in 1999 along with Vasanta Sai Amma, whom He declares to be ‘His Shakti’ and which is described in A Great Leela. Just as when a fan is switched on, it will not start circling at its highest speed immediately, the Satya Yuga which has just begun will take some years to reach its peak. Before that there will be Pralaya or large scale destruction everywhere and which we can see now is happening in the form of devastating earthquakes, tsunamis, katrinas, floods etc being brought about by the sankalpa of the Kalki avatar, Sri Satya Sai Baba. Sri Satya Sai Baba says that ‘His will’ will eventually fructify and that the Satya Yuga will soon reach its peak when men would lead enlightened lives, very unlike his present sinful and ignorant state. The headings discussed above clearly point to Sai Baba as the Kalki avatar. But some doubts may still remain as the name of the village of Kalki avatar’s birth, Sambala and His fathers’s name, Vishnuyasas do not match with the name of the village where Sai Baba was born and with His father’s name. (Puttaparti and Pedda Venkapa Raju respectively). Also Sai Baba doesn’t ride any horse called Devadatta and indulge in war for destroying evil doers, kings or leaders as Kalki is supposed to do. Thus according to Sri Satya Sai Baba the Dasavatars repeat themselves in every Kalpa with minor changes. The details of the Kalki avatar (place of birth and father’s name and His riding of the horse Devadatta) mentioned in the Srimad Bhagavata are obviously of the aspect of the Kalki avatar that had happened in a previous Kali Yuga, in a previous Kalpa. In this Kali Yuga, as Baba said the Kalki avatar has Trifurcated into the aspects of Shirdi Sai, Sathya Sai, and Prema Sai. Thus the story of this Kali Yuga is different as almost the whole of humanity has sunk into the pit of adharma. The destruction of evil one would now leave hardly any survivors. Thus the Kalki avatar has come to educate the masses this time and correct the entire humanity by precept and practice. Since education requires more time, Riding of horse is also not relevant as cars and buses have replaced horses and bullocks in this Kali Yuga, an age of rampant materialism. “But the change will come. The day of awakening is not so far away and when it comes, there will be a true revelation of the true power of God, a manifestation of the Omnipresence of the Lord. This will be the signal for a great move forward and the weeding out of those who are not ready to accept the challenge of the moment. It will be just so, mark My words. But few will listen, very few.